A couple weeks ago, iLoveToCreate designer Lauri Eaton came walking through the design studio and said, "Check out the shirt I just made!" 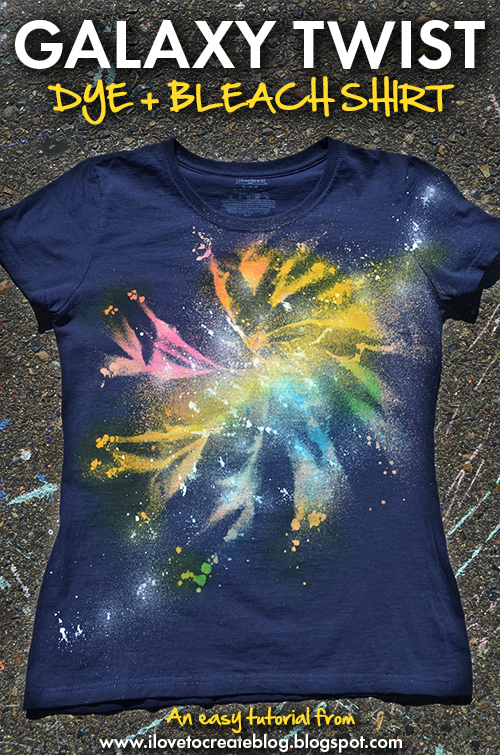 We immediately dropped our jaws and awed at her cool galaxy creation. 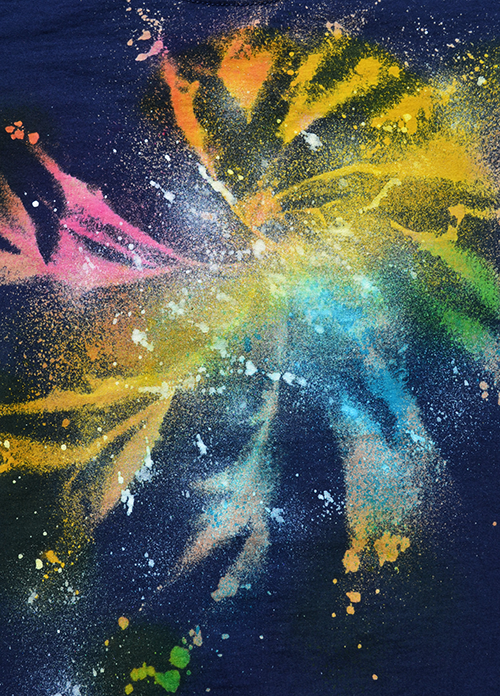 She had been seeing a lot of cool galaxy art shirts and shoes online and was inspired to add in some fun tie dye scrunch and spray effects! Today we share this super cool galaxy technique with you to try at home. It's really OUT OF THIS WORLD! Lol. 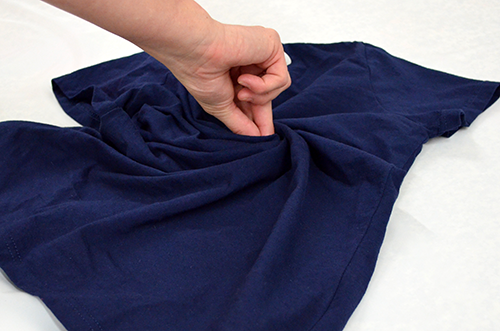 Before you begin: Wash and dry shirt to remove fabric sizing. Note: Washing out the sizing will better allow the bleach to penetrate shirt fabric for a more intense design. Cut a piece of your surface cover and fit it inside your shirt so that the bleach won't seep to the back (since it is plastic, it will easily twist with the fabric). Cover work surface with remaining portion of surface cover and lay shirt with plastic inside of surface cover. Pinch shirt front between thumb and forefinger and twist until entire shirt is in a spiral. Mix a 50/50 solution of bleach and water in spray bottle. 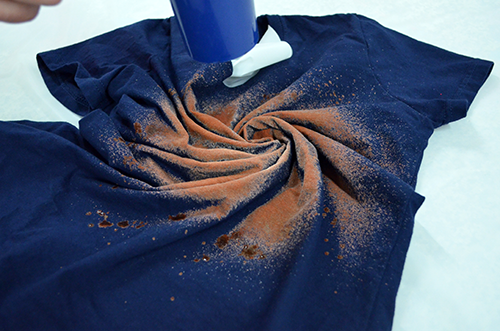 Lightly spray spiraled shirt with bleach solution. Allow bleach to remain on shirt until desired lightness is achieved. Spray again if desired for more effect. To speed up the process, use a hair dryer to blast hot air onto the bleach. Here's what it looked like when we opened up the shirt. 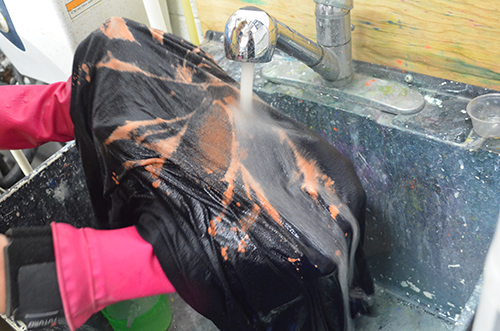 Wash out the shirt thoroughly until all the bleach is rinsed out. You can also throw the shirt into the washer and run through one complete wash cycle. Leave shirt damp for the next step. 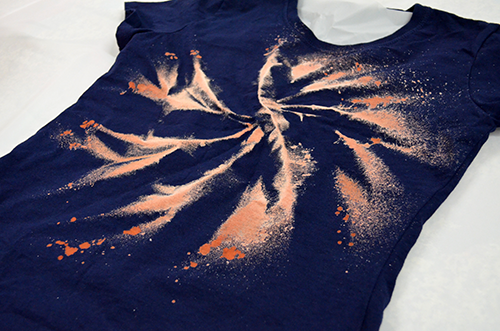 Now mix desired spray dye colors with water and spray the colors onto your bleached design as desired. 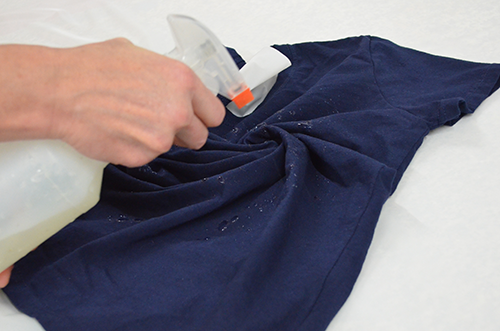 Place plastic over the shirt and allow to set for 6-8 hours or overnight. 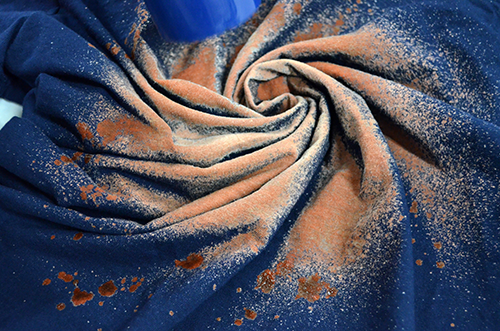 Once finished setting, individually wash and dry shirt according to dye packaging instructions. 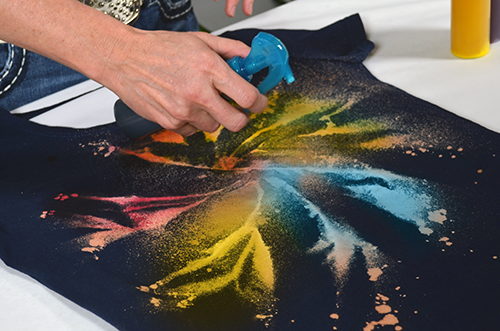 Lay shirt out flat on covered work surface and spray lightly with Snow Fabric Spray paint to create "stars". Let dry completely before wearing and wait 72 hours before washing again. Here's a video showing the entire process! Don't you just love how it turned out? It's so funky! Here's another shirt we made using a black shirt instead of a navy one! 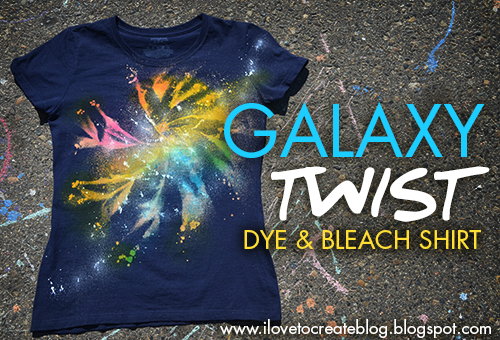 What a cool way to add a colorful nebula look to your galaxy shirt using the dye! My teenager is into the galaxy thing, she will love this. She was actually just talking about tye dying a shirt this way a few days ago. Funny how I came across it today in my reader. Thanks for the easy instructions, I originally told her no, lol. Always looking for new ways to fundraise for relay for life.....these shirts would be awesome! OH MY GOOOOOOOD this is so .... colorful! i guess this will be my next project! this is a great idea for any age. I have been doing alot of projects off these sites. I think they are great! Gonna do this one too with the kids . they love it!! It might be helpful to others to know what I found out the hard way that at the least the Tulip Neon paints only last 45 minutes after mixing. I was making only one shirt, but put water all seven bottles and shook them up merrily. Then I found out that the intensity of the color begins to fade after 45 minutes. You cannot find out about this time limit on the back of the box, only inside on the (very brief) instructional brochure. wow.good job, I also like the bleach t shirt. 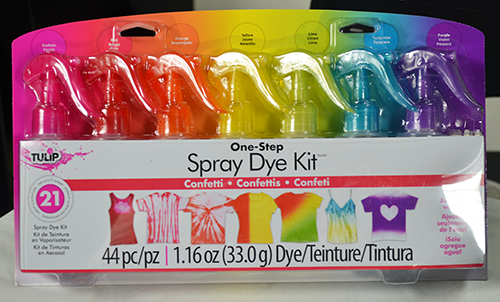 ARe you referring to the neon tie dyes or neon fabric spray paints? I had nothing but issues with this project! I followed the directions exactly and it just didn't work out. First of all the spray dye bottles all broke, not a single one worked well and by the end none were working at all. Talk about a waste of money seeing i was hoping to reuse them. Then when i followed the instructions and washed out the dye i noticed that all but two of my shirts have holes in them. The bleach ate it's way through and ruined them all. So i started with 8 shirts and I'm left with... two that i can even go on to the final step with! Great Shirt. A couple tips I learned back in the 60's 70's when we created clothes like this is YES the Bleach has to be diluted, 50/50 works very well. However, the fabric content makes a big difference too. 100% Cotton will accept the bleaching fast, and DO NOT let it set too long before you rinse and hand wash with soap or Dish Detergent to STOP the action of the Bleaching. You do need to use the Soap or Detergent. 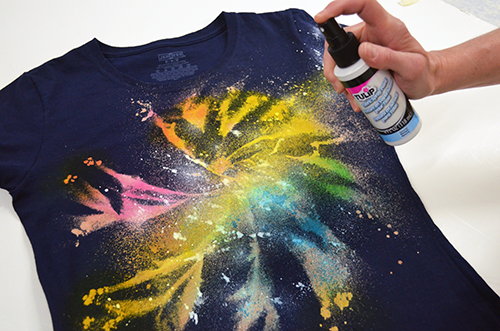 I have Diluted Acrylic Paints such as Duncan Fabric Paints in spray bottles etc and Spritzed many colors onto T-Shirts. Works great for a Stained Shirt to Hide the permanent stain. Dilution will cause the paints to be much lighter, and the paint has to be diluted enough to not clog the sprayer nozzle. Play with it....Another tip is to cut a good sized piece of cardboard to fit inside the shirt or pants. Cover that cardboard with several layers of plain old newspaper. This is a great way to absorb any extra liquid and replace the newspapers as needed. Covering the cardboard with wax paper or the like...only creates a problem if the liquid soaks thru and runs off the wax paper....Project ruined. I know, been there, done that. Hope this helps someone avoid any problems. I learned the hard way. Oh and if you don't have a protected area to work outside...create a well protected and covered area inside. Getting over sprayed paint colors out of a Parquet Wood Dining Table...was not a fun clean-up. I enjoyed this post a lot. 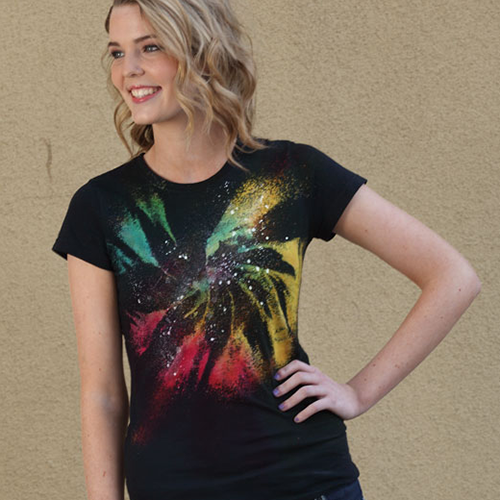 This is great Galaxy Twist Bleach Tie Dye Shirt.Just love the galaxy print.Get the organic cotton t shirts that looks absolutely stunning & matches your personality, style & yet affordable. My daughters and I made these yesterday. Super-easy and lots of fun! The shirts came out great!!! This is such a great idea - so cool! I'm loving it! Will try it as soon as possible! I'm going to try this one! Hopefully in time for my astronomy club meeting or star party! I'll use white glow in the dark fabric paint for the stars and use the old toothbrush and popsicle stick trick to get the splatters. Done that before with different projects, and comes out great. Would there be a difference in the finished design if using fabric spray paints vs spray dye for the main pattern? It is excellent. If I want to make where it will get from?. Would you please give some address where it will be found. After being in relationship with George for five years,he broke up with me, I did everything possible to bring him back but all was in vain, I wanted him back so much because of the love I have for him, I begged him with everything, I made promises but he refused. I explained my problem to someone online and she suggested that I should contact a spell caster that could help me cast a spell to bring him back but I am the type that don't believed in spell, I had no choice than to try it, I meant a spell caster called DR Mako and I email him, and he told me there was no problem that everything will be okay before three days, that my ex will return to me before three days, he cast the spell and surprisingly in the second day, it was around 6pm. My ex called me, I was so surprised, I answered the call and all he said was that he was so sorry for everything that happened, that he wanted me to return to him, that he loves me so much. I was so happy and went to him, that was how we started living together happily again. Since then, I have made promise that anybody I know that have a relationship problem, I would be of help to such person by referring him or her to the only real and powerful spell caster who helped me with my own problem and who is different from all the fake ones out there. Anybody could need the help of the spell caster, his email: Makospelltemple@yahoo.com or call him :+2348108737816. Buy the cheap iPhone covers & cheap phone cases at cheap prices and check out our daily updated new arrival best cool iPhone phone covers at Kase.com. العمل في مجال التسربات المائية فى المدن الساحلية أمر بالغ الاهمية من حيث تأثير الرطوبة بشكل فعال على شبكات الصرف الصحي وشبكات المياه,شركة ساحة الرياض تسعى للعمل بطرق آمنه وإمكانية كشف تسربات المياه بالرياض باستخدام وسائل الكشف عن التسريب الحديثه مثل الجهاز الالكتروني آلفا الذي يضمن تحديد المكان الصحيح الي التسريب,يسمح الجهاز يتمرير الهواء داخل الانبوب واكتشاف مكان التسريب بسهوله دون الحاجة الي تكسير مما يخفض تكلفه الاصلاح. شركة واحة الخليج الشركة الأولى في مجال نقل العفش بجدة لم ترى مثل خدماتنا على الاطلاق كل ماعليك هو الاتصال بنا على 0555583146 وسوف يقوم احد ممثلي خدمة العملاء بالرد عليك . عزيزي العميل اذا مملت من البحث كثيرا عن شركة نقل عفش بجدة لن تجد الا شركتنا هي الوحيدة التي تعمل في هذا المحال من اجل ارضاء العملاء وها بشهادة كل من تعامل مع شركتنا . its really so informative content. Informative and interesting Blog! Beautifully written, as usual, I like the post. Thank you so much for nice sharing with us. Keep posting! I admire the valuable information you offer in your articles. Thanks for posting it..Share Market Company . This looks so simple but the output is so elegant. Thank you for the step by step process explained. This helps a lot. Keep sharing the amazing ideas.